"The Many (Mis) Adventures of DR N": Days gone by. Trail continues up that hill. MY Motocross/ice racing/ WFO days are long gone. Don't get me wrong, I still enjoy spinning the revs to redline, doing the occasional 'ton' on some quiet back road or riding a patch of dirt at elevated speeds. I'm also in reasonably good health, enjoy the sensation of riding off road on my little MX track or some trail in the Arizona desert or up until a few years back, the Baja peninsula. Most of my off road exploits since coming to the Island have been casual trail rides with the occasional faux pa thrown in just to keep me on my toes. Part of my more sedate speeds stem from riding alone. Although I don't like riding in groups as a rule, unless I know the skill levels of each rider, I like to keep it small and intimate, no college orgies of motorcycling here! I'm closer to 63 than 62, and with age comes wisdom or so I and my older friends like to think! 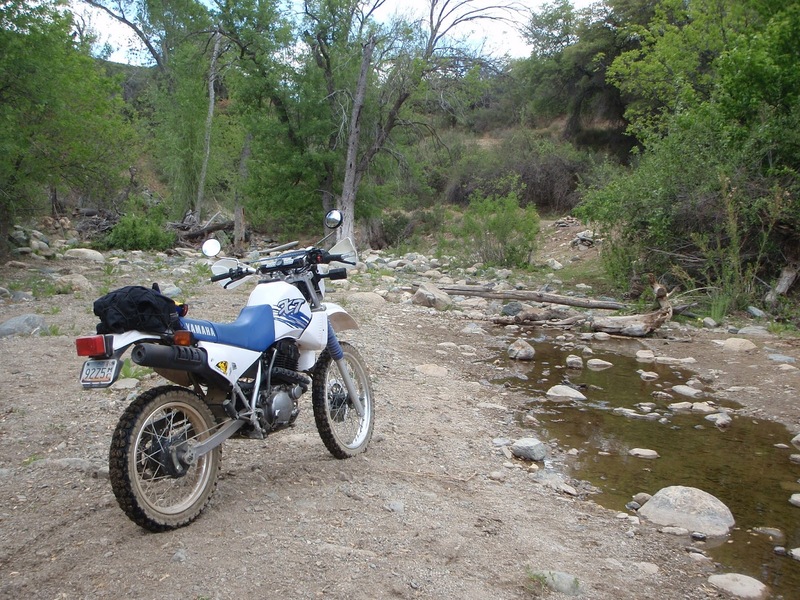 It doesn't matter to me a whole lot if this is riding back roads looking for covered bridges, or trying to connect what appears to be a series of trails in the Bradshaw mountains. I try and prepare myself and my bike both physically and mentally for whatever the day entails. 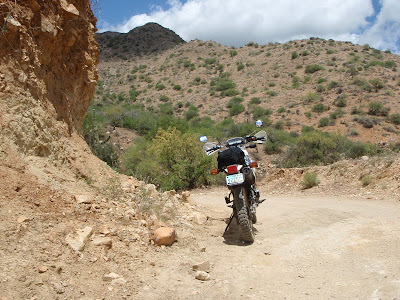 OF course the very nature of the kind of explorer riding I do, there is still the element of danger involved, and I'm not just talking about trail riding here. Anyone that has ever swung a leg over a motorcycle, knows what I am talking about. In the 50 years I have been traveling on public roads I have learned never to let my guard down, practice my skills continually and always, always... keep you eyes on the road, trail and never forget that Mr. Murphy, our community nemesis is there lurking about! Take a ride in the Sierra's of Baja a number of years back. It was going to be a two day, across the mountains, traveling on local trails and no roads. After a steep rutted climb, standing on the pegs for a lower center of gravity and better view ahead, somehow at a very low speed and in 2nd gear, the front end washed out. XT 225 and I smacked into the uphill face of the trail! First thing was to do a mental check and inventory of my parts, which included peeling off much of my gear in the 110F heat and getting my water bottle out. I righted the bike with difficulty and a pain in my right ankle. I was more than 1/2 way to my halfway point about 40 km in and tried to move ahead. I got about 1/2 mile when I was faced with a steep loose rocky hillside with baseball sized gravel. Standing up provided an instant pain in the sore ankle and I stopped for a couple of minutes to think. I knew I couldn't hang about, there was absolutely no shade and as I say, over a hundred degrees! I was 40.5 km in with another 25 on pavement back to camp. I didn't know this route I had not traveled it previously and as such had no fn' clue what was over the next hill! I decided to ride back retracing my steps. The devil you know vs the devil you don't right. Turned out I had a fractured ankle and I wasn't even doing 15 mph! 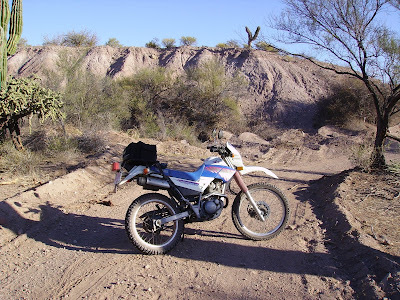 RIDING the Arizona desert is much the same as Baja. My "almost" CB cover shot! 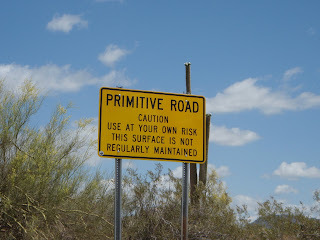 Of course there are 4.5 million people nearby, but riding the Cow Creek road or the Superstitions or the Senator highway mean that I am always having to be ultra cautious as typically help is a long hike away. Only once has my XT 350 let me down and that was a flat tire that I experienced on a weekend and with the help of a fellow rider nearby and Bob, I made it home. Even though everyone I know tells me repeatedly that I am "NUTS" or some equivalent there-of, I have come to the conclusion that I have nothing whatsoever to prove to myself or anyone else for that matter and I decided a couple of years back that I would tone down my off road adventures. 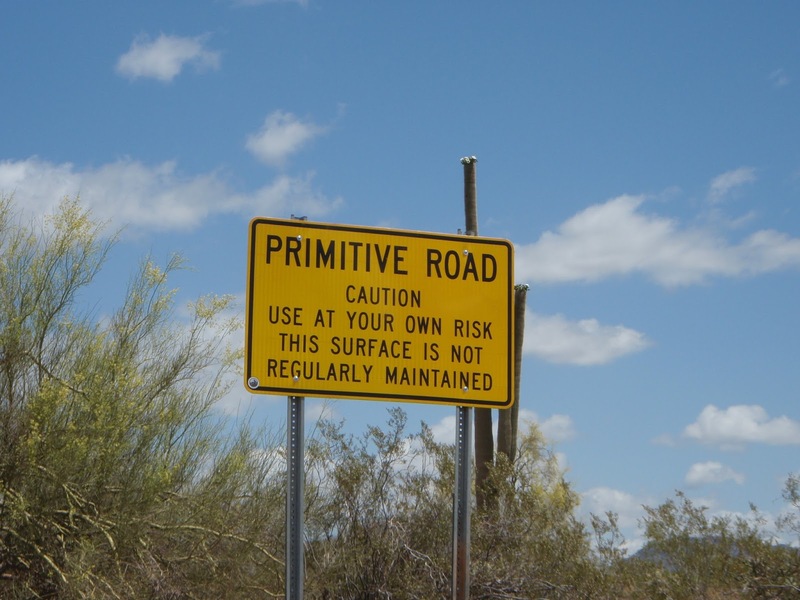 I don't want to die of thirst or get scavenged by coyotes in some dry wash, deep in a desert valley! So moving forward, I plan on being more cautious and less adventurous than I was just a few years back. That doesn't mean I won't be caught out occasionally doing something stupid or dumb or foolish. "Do I cut the grass." or "Do I fire up the 225 and take an hour off for a neighborhood spin." I have several loop rides that can take anywhere from 30 minutes to 6 hours and 30 minutes. This was of the shorter variety and there was nothing new today. I turned North to climb our hill, which is 2.5 km of sandy, hard pack clay track one vehicle wide that offers several trail excursions if you know your way about. The area is often visited by ATV's and Side by's and various dirt bikes by the local 'kids'. I never go fast because a dirt bike or quad can appear from a side trail at any moment, and yes it has happened to me. Traffic on this ride is slight and in the winter it's closed except for sleds. I planned on a short back road ride and then returning the way I had departed. On the way, there is an area that has been clear but provides access to some trails that run through the woods or border the farm fields. These are not maintained trails and by mid summer are grown thick with vegetation. This time was no exception. It has some short steep valleys to cross including a small year round stream which on this day was dry. Indicative of the unusually hot summer Canada has had. Local kids on quads and dirt bikes use it and from the deep ruts it appeared as though ATV's had been through earlier in the year. I rode through without problem on the left tire track and continued on playing on back sandy roads and provincial clay roads. I came back on another trail that connected with the one I had been on earlier. This time I was going to stay on the opposite side from earlier in the afternoon. I had a narrow lip to ride on but plenty wide for my tires. Unfortunately a gust of breeze blew a low lying branch into my face and as I ducked, I in the briefest of moments, veered onto the deep ruts. As I was going over the edge I thought, "no problem" a little throttle and lean back and presto, I'd be through it. Well sure enough I had almost enough momentum and the front wheel stopped on hard pack but the rear 18 incher dual sport rubber disappeared almost completely in mud up to, well truthfully... I didn't know how deep. I only succeeded in breaking the mount for my rear rack. By this time, the top of the wheel had pretty much been devoured in the mud-hole and it was obvious, I wasn't going to get out of here on my own without help. Run the checklist; it's hot but I'm only about 2 km from home. I have shade and I have water and walk-able boots. It was Sunday and Brenda was likely home, Anna I knew could ride the Big Bear 4X4 but the ride on mower was last in the shed so the BB was not coming out unless I got to it. Big Bear to the rescue! Okay... I can walk out and bring the quad but how do I keep the bike upright as it comes out of the bog, neither Anna nor Brenda knew anything about supporting it. The day before, Trevor was at my place and we changed tires on his KLR. I would call Trev! Guess what... no cell coverage! Current seat height, about 24 inches! I decided to start walking, there was no way I would extract the bike that now had a seat height lower that a full blown chopper. I set off on foot and tried the cell at intervals. Just before getting out of the woods so to speak, I had enough bars to call Brenda and have her jump in the car and come get me. My second call was to Stretch and he was able to come and give me a hand. Yup... one doesn't need the AZ desert to get in over their back wheel! EVENTUALLY things did get sorted, the only mishap was with Trev straddling the XT and me towing the bike with a heavy tow strap attached to the lower frame and after it finally gave way, we realized that the bike was still in gear! Honestly, you should see two grown men laugh at themselves! Pretty much a mud pie there gang! So, you see... you might break an ankle in the wilds of Baja CA, or maybe fall in some sand wash on the Crown King Trail being one of the hundred that have to be rescued from the Trail annually... or you could get bunted off the track and end up in bottomless muck, 2 km from home and a cold shower.